So nice to be home! Yesterday I finally got to enjoy a day at home and just go for a nice spirited drive with the Miata. I didn’t actually get out on the road until about 4pm but the weather was just perfect and I didn’t hit traffic so I was quite content. It was a very productive day earlier with 5 hours spent detailing my STi (nice pictures incoming soon). Funny though that I then didn’t want to get the car dirty so I chose to drive the Miata instead. Plus I tend to forget that while the Subaru is significantly faster, corners flatter, and just outperforms the Miata in every metric, there’s always something special about driving top down at 11/10ths through some beautiful scenery. 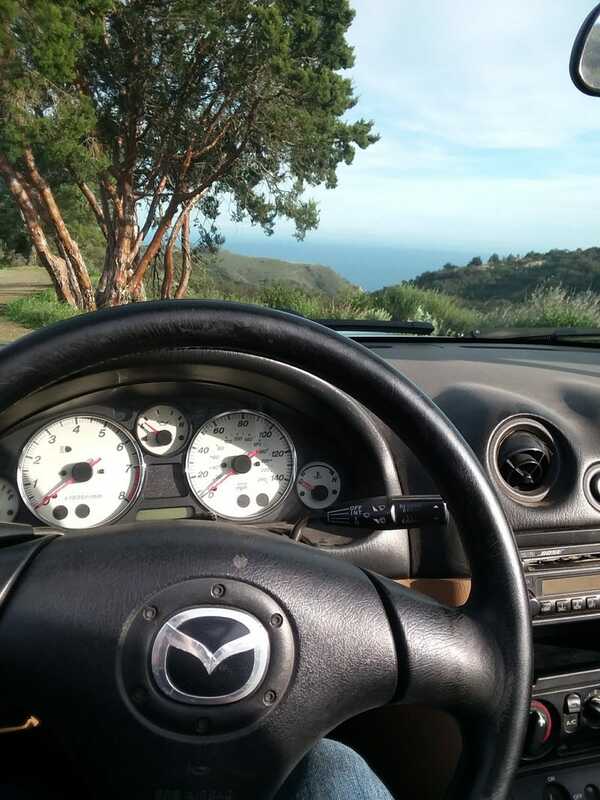 An aimless drive where just listening to some tunes, feeling some mountain air, and taking in the ocean sights, smell, and sound is just spectacular in a Miata. Just to get the Miata on the road though I had to replace my front brake pads and buy a set of jumper cables. I had killed the battery last week by leaving the stereo on since I have it not connected to the ignition. I like having the option to use it without a key but of course I have to remember to shut it off. After jumping it with the Subaru, I was in business and the new pads and brake hardware were nice and silent. I put them through the ringer with Latigo Canyon as well as Decker Rd, both my favorite Canyon roads since I can keep the car in second most of the way, with just a few third gear sections. Washed, clayed, sealed, and waxed. I need to take a better photo outdoors. It’s crazy bright in the sun, like it hurts my eyes. Looking forward to finding a good spot to take STi photos. I won’t be able to do justice in a phone camera photo but it’s definitely clean as hell. Claying and sealing both took forever but was well worth it.